Vista Verde offers hikes for every interest. Your choices range from mild, wildflower walks to all-day challenging adventures above the timberline. As with all our activities, our guides will tailor the experience to your desires. Our backyard is laced with terrific hiking trails. 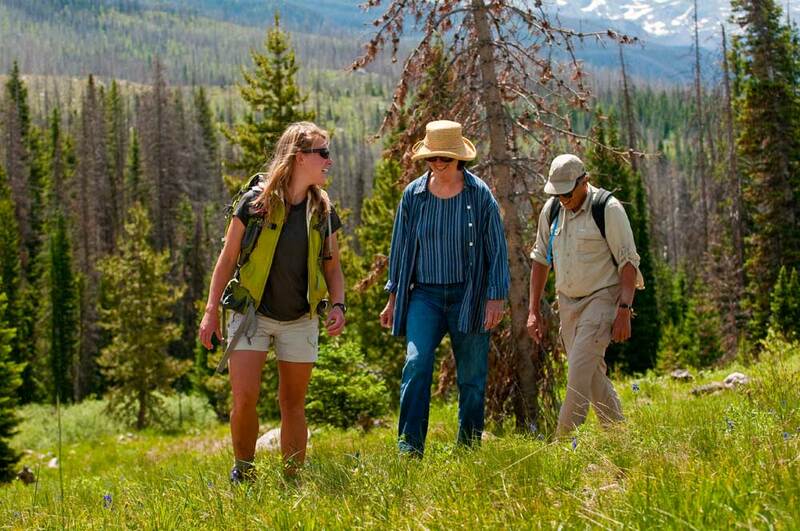 Located in the Routt National Forest close to the Zirkel Wilderness Area, Vista Verde is only a hoot and a holler from a host of trailheads that lead to extraordinary hiking. As the direct benefit of our champagne powder snow of winter, the Zirkel Wilderness just to the east is transformed into a lush and spectacular watershed in summer. To the north, the Hahns Peak/Columbine area offers many joyous hikes as well. Our hikes may follow flowing creeks that tease us with rushing water, climb up to panoramic splendor, meander through a wealth of wildflowers or stay in the enchantment of an evergreen or aspen canopy. The sounds of dancing streams and mountain chickadees, the visual splendor of colorful Columbine and Indian paint brush, the sights of snow capped peaks and pristine alpine lakes, and soothing smell of pine and fir trees all create a special sensory experience. Breathe in the freshest air on the planet and enjoy with us the serenity and spaciousness only a mountain hike can provide. Families and fun are the major focus of summer at Vista Verde. The goals of family fun hikes are to give the entire family a fun-filled experience. One such outing is to Gilpin Falls, a short duration, low intensity, and mild terrain type hike. With a spectacular waterfall, lots of rocks to climb on, refreshing wading pools and plenty of stones to throw, this is a youngster’s paradise. This is an old mining site, and there is a lot of history and turn-of-the-century gold mining equipment to examine and ponder. How did they get that gear up here?! We want the youngsters to have a great experience and develop a joy of being active in nature. Such an experience translates to fun-filled memories. There are plenty of snacks in our backpacks to munch, plenty of family photo ops and plenty of mountain air to help digest the magic.